You’ve probably noticed that December is the month for Best of the Year lists, which, for me, truly makes it The Most Wonderful Time of the Year. These lists provide the easiest way to revisit the music you’ve discovered over the past year, as well as catch up on what you’ve missed. Our Head of Outreach Rob Toledo spotted this awesome tool first, and I immediately pounced on the opportunity to dig into what everyone is listening to at Distilled. Not everyone here uses Spotify, but I got summaries from about ⅓ of us. Biggest Listener: Video Editor and Animator Margarita Iosif wins this title by a landslide, with 97,677 minutes of listening - that’s 1,628 hours! She also wins Most Loyal Fan of both her favorite artist, Archive, with 1,848 streams of their music this year, and Most Loyal Fan of her favorite album, Tribes’ Wish To Scream, with 914 listens. Margarita also dominates the Most Number of Shoes Owned at Distilled category, but that’s another story. Rob came close to this feat: His most-listened-to artist, album, and all of his top 10 tracks are Caspar Babypants. Caspar Babypants is a children’s music artist who used to be in the Presidents of the United States of America. Rob blames his results on his 1-year-old son, who listens to the album at least once a day, but we all know the truth. We’re a clever bunch here in Seattle. Most Appropriate Top 10 Song: Our Content and Community Manager extraordinaire Chéri Percy wins this one with her #2 most-listened-to track, “Beat Your Heart Out” by - wait for it - The Distillers. I see what you did there, Percy. Highest BPMs: Our Head of Consulting Ron Garrett claims this honor, which shouldn’t surprise anyone who knows him. Ron fulfilled a longtime dream this year of attending Tomorrowland, a large electronic music festival held in the town of Boom, Belgium, no joke. Even the paragon of professionalism and dedication (which Ron totally is) needs to let loose every now and then. I’ll Start My OWN Playlist! With AlunaGeorge! And Little Dragon! : Senior Designer Leonie Wharton is well-known within Distilled for her fabulous taste, which extends to the music realm as well: She played her self-made playlist “leonie-rave” no fewer than 3,679 times. The woman knows what she likes! Then contrast this with the fact that her 2013 stats are made up completely of A$AP Rocky, Jay Z, Prof, and The Game. I did not see that coming. Loves Their Top Song The Most: Principal Consultant Kate Morris listened to a song 125 times this year to get amped up for her many client meetings and conference speaking appearances. You may have heard it: A little ditty called “Can’t Hold Us” by Macklemore & Ryan Lewis. Prettiest Collection: Senior Consultant Mike Tekula. The more I learn about Mike, the surer I am that he’s a secret Renaissance man. Not only is he a fantastic consultant, he’s a gentleman, a scholar, an outdoorsman, a good drinker, and a connoisseur of instrumental music, apparently! Mike’s #9 most-listened-to song this year was Fleet Foxes’ “Blue Ridge Mountains”, which, for my money, is one of the most beautiful songs ever. Biggest Headbanger: London Office Manager Cheney Houseman. Cheney may have missed her calling as an alt-rock DJ, as her Top 10 is made up of tracks from Two Door Cinema Club, Rage Against the Machine, Modest Mouse, Interpol, and Foo Fighters. Rock on! The One Person I Know Who Apparently Liked Yeezus: Graphic Designer Matt Mitchell-Camp. He streamed it 105 times in the 6 months since it’s been out. This earns him a spot with Britt in the “Surprisingly Gangster” club. Claims He’s “Old” But Whose Top 10 Is Pretty F*!$in Awesome: Head of Paid Search Richard Cotton. As he says, none of it is from this century, but damn, what a list! There’s not a dud in the lot! How Classixx’s “Hanging Gardens” is not on here is beyond me. So tell us: What were your top artists, albums, and tracks of 2013? 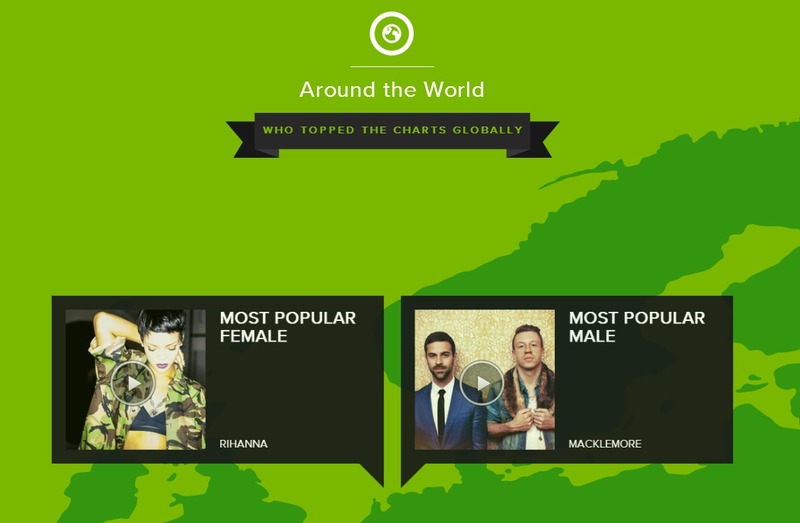 What’s your take on the stats in Spotify Year In Review 2013? And if you like what you’ve seen and heard here, I’ll be putting together the music for our next conference, SearchLove Boston in April 2014. Come rock out with us!